NASHVILLE, Tenn. — RoadTripSports.com is proud to announce the release of the 2018 edition of the College Football America Yearbook, an annual publication that previews every college football conference at every level of college football in the United States and Canada. The fifth annual print edition is available via Amazon.com and Barnes & Noble.com at a list price of $39.99, while the digital edition is available via iBooks for $9.99. Many retailers, however, offer the print edition for even less. “Counting high school games, bowl games and all-star games, our staff attended more than 100 football games again in 2017,” says Kendall Webb, the publisher of the College Football America Yearbook. “Then, like we always do, we spent the spring sorting it all out and preparing the latest edition of the yearbook. 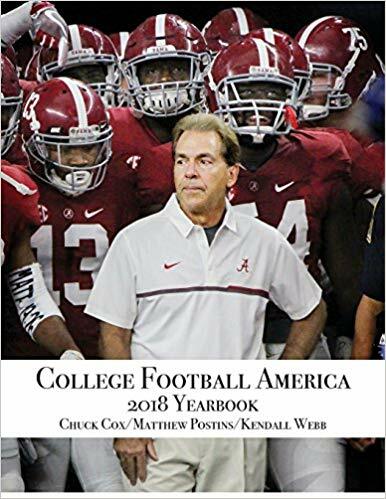 The College Football America Yearbook is published independently by Webb with Matthew Postins serving as the publication’s editor-in-chief. Chuck Cox, meanwhile, assists as the director of editorial content. All of the publication’s staff members are members of the Football Writers Association of America, and collectively serve on the selection committees for several of college football’s major postseason awards. This year’s book features Alabama head coach Nick Saban on the cover. Saban led the Crimson Tide to a fifth national title under his watch in 2017. Top Ten Games of 2018: Five FBS games and one game each in FCS, Division II, Division III, NAIA and Juco that will be impactful this season. The Heisman Race: A look at the front-runners and dark horses for college football’s most prestigious award in 2018. The Dream Team: The College Football America Yearbook’s unique take on major college football’s All-America team. Schedules and Results: 2018 schedules and 2017 results for every college football team in the United States, including all NCAA, NAIA, NCCAA, USCAA, NJCAA and CCCAA programs. Additionally, College Football America 2018 Yearbook previews all of the conferences at every level in the United States along with the four conferences of Canada’s U Sports. The yearbook also provides updates of Mexico’s CONADEIP and ONEFA leagues.